Karbonn recently released its ambitious plan to catch up with the emerging global trends in the coming year 2014, and by the end of the year, another smartphone from Karbonn, Karbonn Titanium S4 (Quick Review), with a price tag of Rs. 15, 400. At the start of the year Karbonn launched Karbonn Titanium S5 (Full Review) which is the predecessor of this smartphone. Let’s see how these two phones compare with respect to each other. The Karbonn Titanium S5 featured a 5 inch display with qHD (960 x 540) resolution which amounts to 220 ppi. The display type is IPS LCD, which implies sharper viewing angles. The Karbonn Titanium S4 comes with comfortable to hold 4.7 inch display with 720p HD resolution which will give you higher pixel density of 312 ppi, which means a very sharp display. The display type is AMOLED, which implies darker darks than IPS LCD due to absence of back light. The display type will be better suited for those who love to watch videos on their smartphone screen. The contrast and darks will be pretty good. Those who like to read on their smartphones should prefer Titanium S5’s IPS LCD display, because the whites in AMOLED are not as good. Processor employed in Karbonn Titanium S5 is Qualcomm MSM8225Q Snapdragon quad core processor clocked at 1.2 GHz assisted by Adreno 203 GPU and 1 GB RAM. The Karbonn Titanium S4 comes with 1.2 GHz quad core processor whose make has not been specified. Both of these smartphones have 1 GB of RAM. The primary Autofocus camera in Titanium S5 is of 8 MP and is supported by LED flash where as the new Titanium S4 comes with 13 MP shooter at the back, which is more in line with the modern trend. The 8 MP camera on Karbonn Titanium S4 was pretty good. We can expect the camera to be at par with the high rank domestic phones. Both of these phones have a 2 MP shooter at the front of video calling. The Internal storage also leaves nothing to choose from. 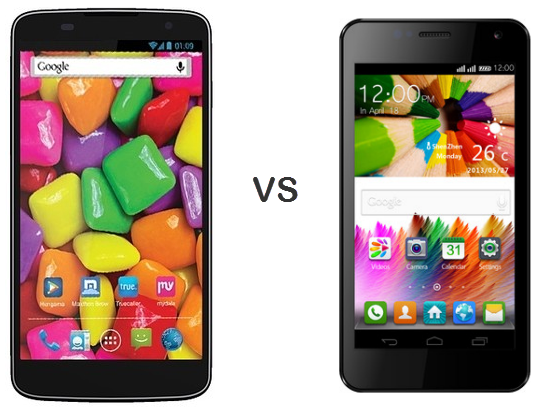 Both of these phones have 4 GB internal storage, which is disappointing in case of Karbonn Titanium S4. At this price point we expect at least 8 GB of storage considering the modern trend. Of course you can have SD card storage up to 32 GB using MicroSD card. The Battery capacity of Karbonn Titanium S5 is 2000 mAh and you can squeeze 11 hours of talk time on 3G and up to 200 hours of standby time, which in itself is nothing to boast about. The Karbonn Titanium S4 on the other hand offers 1800 mAh of battery, which should give you similar backup. The Karbonn Titanium S5 comes with Android 4.1 jelly bean where as the Titanium S4 comes with Android 4.2 jelly bean operating system. You will see some slight changes like more functional Lock screen with widgets, enhanced security and minor UI changes. Both of these smartphones support Dual SIM connectivity. Karbonn Titanium S4 will definitely give you better and competitive display. The camera specs are also in line with the modern trends but the competition will only get stiffer with arrival of phones like Moto G in India. Considering the price points, Karbonn Titanium S5 is selling for approx 10,500 INR and is more value for money device compared to Karbonn Titanium S4 with a price tag of Rs. 16,000 Approx. We expect the price to fall in the near future.